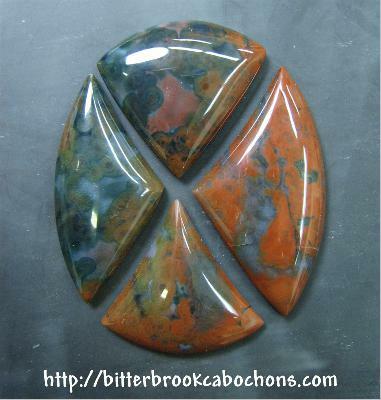 Here's a quartet of freeform Ocean Jasper cabochons, all cut from one 52mm oval. No two are alike, but each would make a beautiful pendant. But how about FOUR pendants? These were photographed on an Obsidian slab since I was in a remote location at the time, away from my photography "stuff" at home. Largest cab (right) is 37mm x 20mm; smallest cab (bottom) is 25mm x 25mm.